My hands down favorite of the three is Angie’s Popcorn. It doesn’t taste like a substitute food because it isn’t one. However, the tenets of Wheat Belly suggest that you shouldn’t be eating anything made with corn because of its effect on your blood sugar. This gets relegated to the “once and awhile” pile, but it is absolutely delicious. Slightly higher fat and calories than the other options, but good serving size, lower carbs, and totally worth it. The Snikkidy Eat Your Vegetables Veggie Chips are not something to be eaten by themselves. This isn’t to say that they taste bad, but they aren’t all that exciting- this is a good gluten free substitute for potato chips or tortilla chips if you need something to use for salsa or guacamole. These are a good vehicle, but for the nutritional content and serving size, there may be a better alternative out there- I’ll keep looking. 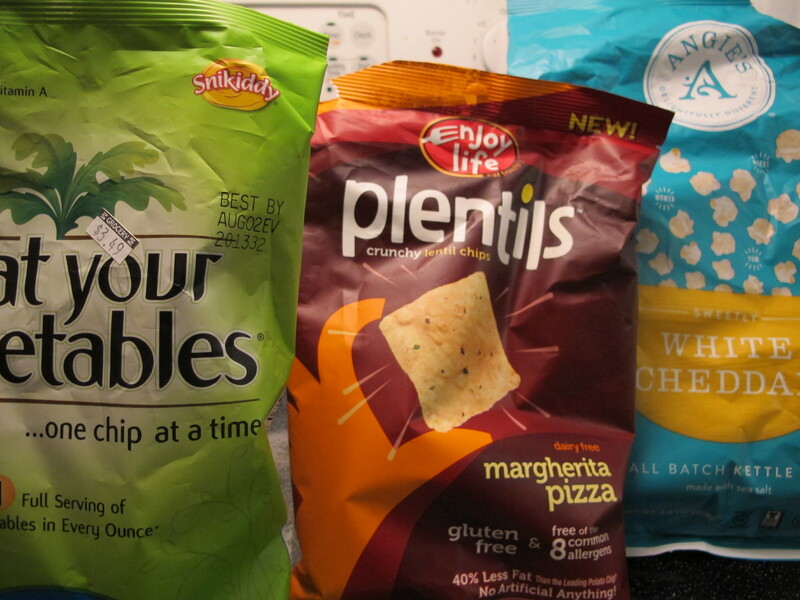 The Plentils (Lentil Chips) were good! I tried the “Margherita Pizza” Flavor (Gluten Free snacks don’t always come in a “plain” flavor) and they can be enjoyed on their own, with a satisfying crunch. The flavoring is mild enough that these could also be used to dip into salsa etc. A good chip substitute or everyday snack, and the serving size is generous.